only about a tragic situation on which I was commenting. So many people in denial, I thought as I moved toward the bathroom in our home for the first time that morning. Looking in the mirror and wondering why I had such a hard time falling asleep last night, I noticed I was leaning a bit to one side. As I wondered why I might be doing that, I became aware of the intense pain I had been blocking - surely not denying - all night long. It had kept me awake until nearly two in the morning, but had you asked me (and Erin did ask) I would have denied - oh no, there's that word - being in any pain at all. Dammit! 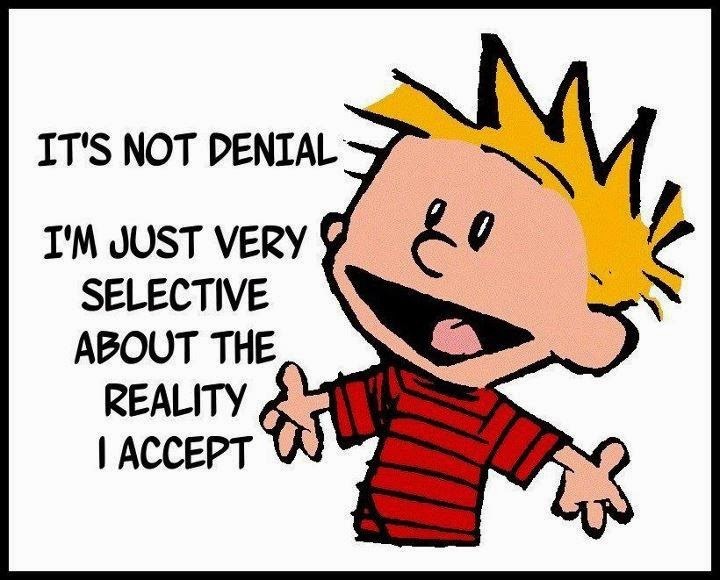 I learned denial as a survival mechanism when I was a child. In my universal child's world view, if things were normal, then I must be safe; if things were not normal, I was in danger. Therefore, all in my world was normal even in its abnormality. It is a strategy that works...for a time, and then it wraps around and traps us in the greater pain of disconnection from our very selves. Yesterday I sat at the kitchen table and worked all afternoon writing and producing low quality video blogs <grin>. It's my practice to do so because I have discovered that working at the table in my office chair (yes, my office chair sits at the kitchen table because it allows me to eat meals in relative comfort) caused me to feel better than working in bed. Mind you, I hadn't been working in bed because I am lazy but rather because it is the only place I thought I could work when my pain is severe. As I sat in my chair all afternoon and dinner approached I became aware that I was in fairly significant pain. How could this be? Well, some of it was because I was really into the work I was doing. A lot of it - who knows how much - was due to my ability to block my pain, both physical and emotional, until it reaches a certain threshold and the levee breaks. As a good interspiritual practitioner, I have heard all of the talks about how bad this denial of pain is for me - and I don't disagree - and have listened to seemingly endless guided meditations (those of Shinzen Young are the best, in my opinion) to help me get back in touch with my body. Turn toward the pain, embrace the pain, watch it change, where is it now - and all of it works while you are actually doing it and for a short time afterwards. My problem is two fold. The first is that even as I write about this I become more aware of my pain and it is difficult to continue. I could go lay down and do a guided meditation, but (here's number two) sooner or later I really want to get stuff done. 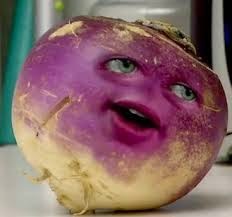 I could choose to return to bed at the first sign of pain and listen to a guided meditation, but I do want to be more productive than a turnip, even a turnip with a toothy grin and nice eyes. Sure, I would love to retire to the monastery. In fact, you can read about my plans to do so here. It's not time for that quite yet, however. I have much to do before retiring, including getting my throwing arm in shape. You'll understand if you read about my retirement plan. allows me to be a contributing human being for a longer time, right? Wrong. As I intimated earlier in this article, blocking pain only works until a threshold is crossed. Once that happens, when the levee breaks, the only effective alternative is to turn toward the pain. Can I say how much that irritates me? It means I have to drop the denial, admit I am compromised, and go let Shinzen Young whisper in my ear. I hate that reality! Everything in me rebels against it because I have not yet successfully completely deprogrammed myself from the cultural message that worthwhile males are productive males, and males who are no longer productive need to be thrown on the scrap heap. The only moment I don't feel that way is when I find myself immersed in spiritual practice - especially spiritual practice that has as its focus the real issues confronting human beings. Such practice can be found in every tradition, but many popular expressions of spirituality choose something else as their primary focus - usually the groin and the things that happen there, and at my age I am grateful to have been based with a decreased obsession around and about the groin - both mine and those in the possession of others. Pain, both physical and emotional, may be the universal human experience. Even those rare people afflicted with congenital insensitivity to physical pain still feel emotional pain. 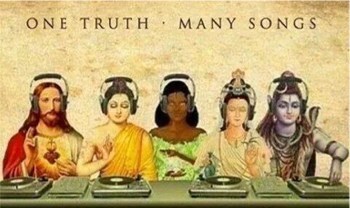 In fact, I believe that it is pain that opens us to spirituality both initially and in ever deepening ways. I have long read people who claim that pain and suffering are somehow separable, that we can have pain without suffering. They say that suffering occurs when we resist the pain, resist the change in our lives that pain represents. Often these people come from the Buddhist tradition, and I understand where they are coming from...but I am not sure that belief is nuanced well enough. There is pain, both physical and emotional, that is so severe suffering is inherent in it. I believe that there is a threshold within us that, when it is crossed, suffering occurs. That kind of pain reaches out and grabs us, and in my experience it has not been possible to accept that pain, turn toward it, or do anything else with it. My post-operative pain after my back surgery was certainly like that. I believe that there is some pain so severe were are biologically hard wired to seek some degree of relief before anything else is possible and to deny that is to do a disservice to us all. What's more, to say "I'm not suffering" at moments like that is to be in denial about the reality of our experience in that moment - and that leaves us not only hurting but confused. Back in the day, I was playing third base on a softball team when someone hit a low line drive directly at me. I tried to drop to the ground to block it with my body, but it was coming so fast I couldn't get my glove or my body down fast enough. The ball glanced off my cup and hit me on the inside of my left thigh so hard that the image of the seams of the ball was clearly visible for weeks in the bruise that developed. Adrenaline allowed me to chase the ball down and throw it back in to the infield, but I then collapsed in pain. That was suffering. It was so ridiculously intense that I couldn't remain standing. At that moment, there was no "breathing into the pain." There was just blinding pain - I couldn't see anything but bright, primary colors. The same thing happened when I partially tore my Achilles tendon on softball diamond. I learned there is a pain so severe we lose the ability to remain standing. It's a kind of sensory overload that seems to shut off our legs. To say that this kind of suffering occurs simply because we are resistant to change or to reality is just silly. It would also be silly to say that when we are writhing in pain we think, "Gee, some spiritual practice would be good about now." It is in our recovery period, which may well still include pain that induces suffering, that the door opens to spirituality. is to severe to block or deny, at least we can deny our suffering. Can we see that there is a spiral staircase of worthlessness that begins with pain, continues to descend toward productivity as a measure of worth, descends further into suffering, until finally we are in a black hole from which it can be extremely difficult to extract ourselves? 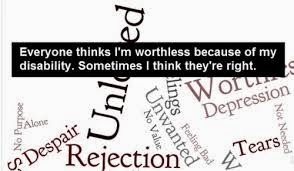 We will struggle to extract ourselves from the black hole of worthlessness because ultimately it is love that heals us, but if we feel we are worthless it will be almost impossible to believe we are lovable. When we believe we aren't lovable it doesn't matter how many people are showering us with love, we will be beyond the ability to feel it. It's as if we have been vaccinated against love, and now will require increased doses to have any impact at all. I'm fortunate to have a loving wife who loves me through my weaknesses and faults - of which there are no shortage! I understand that we all aren't that fortunate, and even for those of us who are there remains the question of our value in the universe. We ask ourselves, "why am I here?" and the answer can be hard to find. I am convinced the answer lies in spirituality, because it is spirituality that gives us the ability to see beyond the human constructed systems that can only provide artificial, arbitrary, temporal, and temporary value. We simply can't see the big picture, for example, within the confines of consumer capitalism. It is consumer capitalism that says we are only worthwhile as long as we can be a cog in the machine, but consumer capitalism is a relatively recent invention! It surely cannot explain why people had value prior to its inception. In the late 1960s Ram Dass and others traveled to India and found their guru. 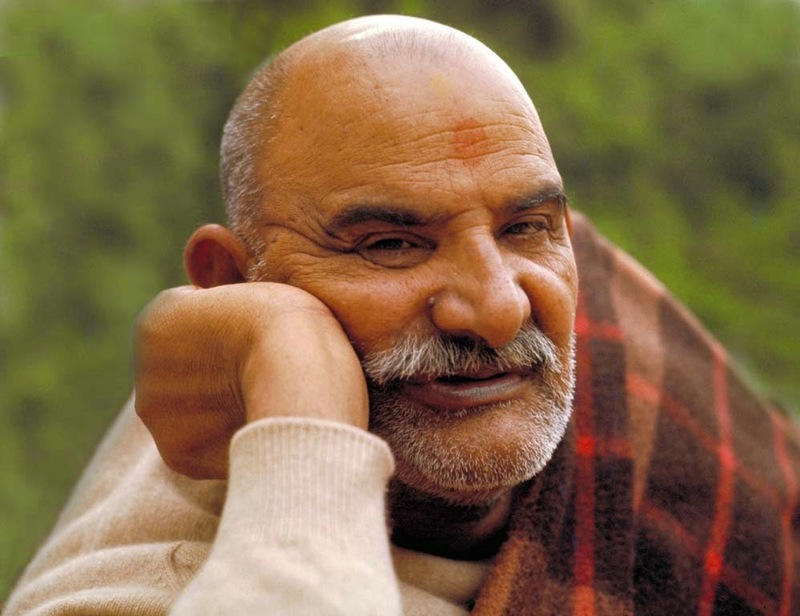 In the case of Ram Dass and those who followed him there, that guru was Neem Karoli Baba. What they experienced was unconditional love, something I have both heard and written about but in truth can neither explain nor understand. How do you know you are experiencing unconditional love from someone just by the way they look at you? 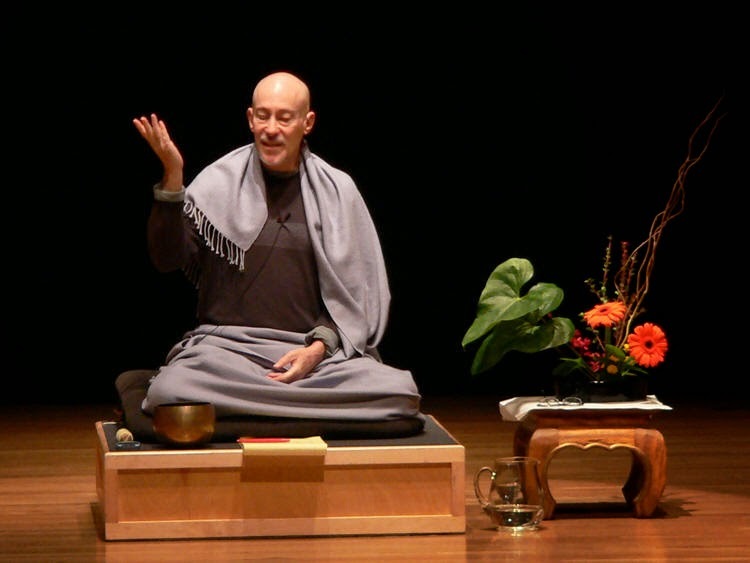 What is it like to have a spiritual teacher whose teaching is their presence? I can't imagine - but I can imagine what a healing presence he must have been. Christians talk about love, but then seem to spend most of their time coming up with reasons to exclude people from their circle of love. Here was a guru who loved people American culture of the 1960s saw as pretty much disposable - hippies, drop outs, those who used drugs regularly including LSD and other hallucinogenics, and so on. How does that happen, and how healing could that be to those of us with disabilities? Is it love that allows us to finally drop our denial? Answering this question is a big part of my current journey. I will keep you informed!